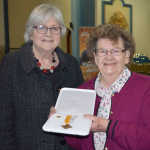 Warm congratulations to Mrs Chrissie Moley from St Gerard’s Redemptorist parish is Belfast who was recently awarded the Benemerenti Medal. 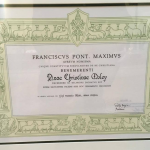 The Benemerenti Medal is an honour awarded by the Pope to members of the clergy or laity for service to the Catholic Church. Chrissie has given over 40 years of service to St Gerard’s parish working as sacristan and as a member of the Apostolic workers. This is a well deserved recognition of Chrissie’s hard work and dedication to the service of St Gerard’s Parish. Well done.